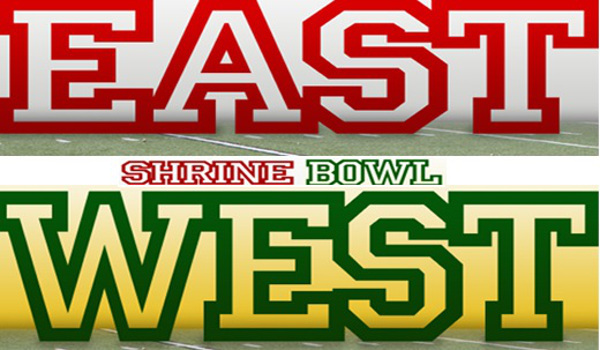 When it seemed like the East All-Stars had done just enough to capture a third consecutive win in the Kansas Shrine Bowl, the West found a way. The West All-Stars claimed a dramatic 22-21 victory when Zach Helbing (Mulvane) and Tanner Orand (Goddard-Eisenhower) combined to tackle East QB Brandon Mlekus (Frontenac) in the end zone for a safety. Mlekus scrambled to get out of the end zone after trying to recover from an errant snap. The victory gives the West a 27-16-1 all-time advantage in the series. On a night headlined by turnovers and sloppy play, the East had multiple opportunities to make a 21-20 lead stand up. The East was handed a golden opportunity to extend its one-point lead in the fourth quarter when the West mishandled a punt giving the East a first-and-goal. But a 15-yard chop-block penalty moved the East back, and eventually a fourth-down pass fell incomplete in the end zone. The West took over with less than three minutes to go, trailing 21-20, and without a timeout. On their first play, West QB Jacob Murray (Great Bend) heaved a long pass downfield that looked to be intercepted by Emporia’s Bryce Crouch, but Crouch couldn’t hold on for his second interception of the game. The next play, Murray hit Kaden Davis (Ellsworth) on a long catch-and-run to the East 30. The West appeared to be poised to get even closer. Murray hit Dylan Foos (Dighton) on a short pass with room to run, but he was stripped by Nick Bulleigh (St. Thomas Aquinas) and the East recovered essentially sealing the game. The East was called for two unsportsmanlike penalties after the play, moving the ball back half-the-distance, twice, inside their own 5-yard line and setting up the decisive defensive play. The West almost forced a safety on the first snap, but the East was ruled to have advanced the ball just over the goaline and inside the 1-yard line. On second play, the snap sailed wide left of Mlekus. Trailing by a touchdown at halftime, the East scored on their first offensive play of the third quarter as J.J. Letcher (KC Piper) raced 73 yards untouched on a jet sweep to tie the game at 14. The East took a 21-14 lead later on a Mlekus touchdown run. But the West responded shortly after as Zach Esau (Hesston) hit Foos on a short touchdown pass. The two-point conversion failed leaving the East lead at one point. The West seemingly dominated a turnover-plagued first half until the final minute when Dalton Cowan (Topeka Seaman) hit Cuttar Huss (Troy) on an 18-yard touchdown pass to pull within 14-7. The two teams combined for seven first-half turnovers (5 for the West). The West built a 14-0 lead on a 40-yard touchdown pass from Murray to Davis, and a 1-yard run by Esau. The MVPs of the 44th annual Shrine Bowl were Lechter from the East and Helbing from the West.